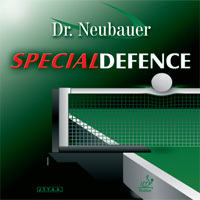 SPECIAL DEFENCE has a high friction surface without being sticky. Its innovative top sheet allows chop shots to be played with an excellent backspin effect and very good control. Even very fast and high rotation looped topspin shots can be returned easily with a flat flight path. The exceptional control also enables a very effective spin variation between heavy chop and "float" balls. This rubber is particularly effective in combination with short, half-long or long pimples, as well as anti-spin rubbers. SPECIAL DEFENCE also enables surprise attacking shots, either looping or hitting, in order to change the rhythm of the game.